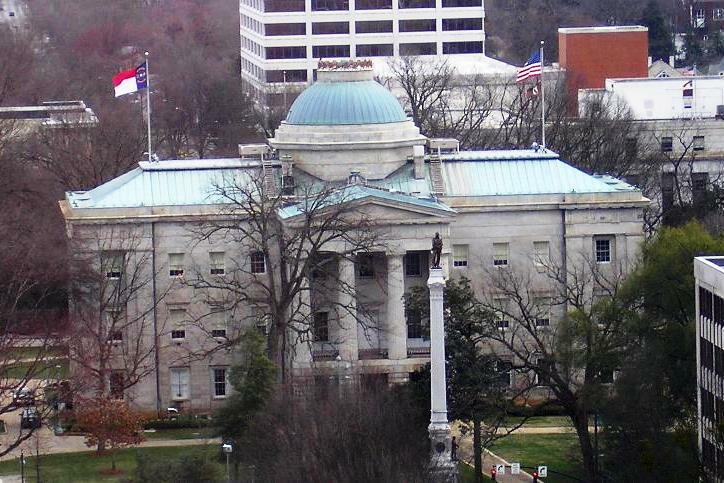 North Carolina became a state November 21, 1789, the 12th state admitted to the Union. The town of Raleigh was laid out in 1792, after the Assembly decreed that a “seat of government” should be set up within 10 miles of Isaac Hunter’s Tavern. They sold lots for residences to help finance the building of the capitol. After the Civil War, Carpetbaggers ruled the Assembly. They set up a bar in the capitol. You can still see nicks in the marble steps where they rolled the whiskey kegs up to chambers. The North Carolina State Museum is in a beautiful park beside the capitol. Fifteen miles from Raleigh is Research Triangle Park, which serves Duke University, University of North Carolina, and North Carolina State. Raleigh isn’t too far from the Wright Brothers National Memorial at Kitty Hawk and the Cape Hatteras National Seashore. The shimmer wall and sturdy oak trees everywhere, the museums and plazas planned so logically for public use with the capitol center square, the pride in education, the taverns and reminders of the colonies, the British touch. Mountains near: Appalachian Mountains. Mount Mitchell in the western part of the state is the highest point in North Carolina at 6,684 feet.